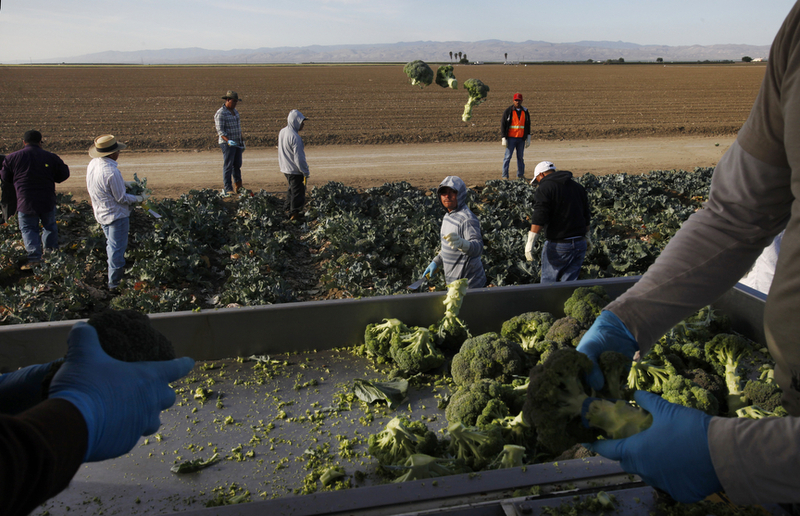 Louis Mendoza, left, and Will Martinez, right, collect and box broccoli as it gets tossed to them from workers, from left of Mendoza, Jose Santo, Nelson Villanueva, Miguel Hernandez, Louis Cornejo, Jose Francisco Cornejo and Jairo Alvarado while they harvest from a block on Pappas & Co farm April 18, 2014 in Mendota, Calif. The historic drought combined with zero percent water allocation for farmers in the San Joaquin Valley means that many farmers are fallowing fields and many field workers are unemployed. In Mendota, a rural city of about 11,000 people about 35 miles west of Fresno, the jobless rate is 36 percent.